My brother had this sitting on his back porch, and asked me if I wanted it before he threw it out byt the curb for the scrappers. Always on the lookout for the next basket case, I decided to grab it. I'm not sure why exactly, nostaligia maybe? I do have to say that it brings back memories of working on my hand me down, campus green varsity back in the early 80's. I'm cogniscent that this bike isn't going to be a long term resident in my garage, the frame is too small for me, and I'm doing this more as a way to relax than anything. Bearing that in mind, I'm desperately trying to keep the replacement parts list short so I can try and sell it on Craigslist. 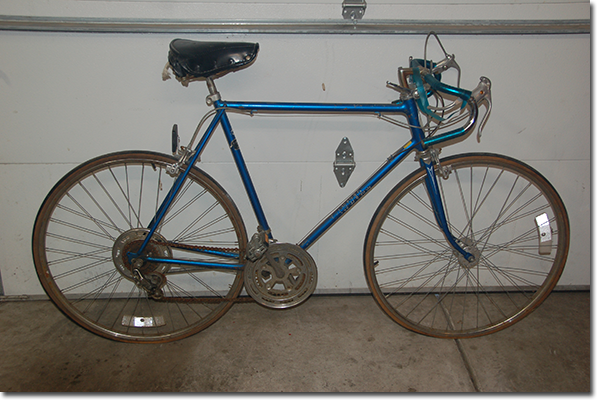 Unless you have a '61 Continental with the lever on the front derailleur or the '61 8 speed varisty with 26" rims, these bikes don't sell for much. So far te bike has been stripped. The headset is the deluxe verion, and with a lack of lubrication the top races on these are usually pitted, but this one was OK. No surprises in the crankset, and everything seems reasonably intact. It will need two cables (I'll reuse the rears on the front), an anchor bolt for the rear brake, and tires. The handlebar tape is cut in the middle of the wrap, but I'm going to see if I can piece it back together. I'm going to see if I can up with some used tired, and probably a new chain. If I can keep the parts under $20, I'm hoping to be able to sell it for $50 or so. If no one bites, I'll donate it to Working Bikes. I'd rather do that then see it going to the scrap heap.